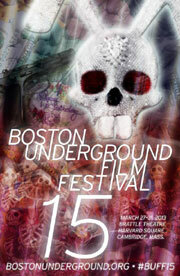 Several familiar names topped the list of award winners at the 15th annual Boston Underground Film Festival, which ran at the Brattle Theatre last month on March 27-31. The big winner was Zach Clark whose latest film, the Christmas-themed comedy White Reindeer, won the Best Feature award. This is the 2nd time Clark has taken the top award at BUFF, having previously won for his first feature, Modern Love Is Automatic, in 2009. You can also watch White Reindeer online. Other winners include Drew Tobia taking home the Most Effectively Offensive award for his debut feature See You Next Tuesday, a film that previously tied for an Audience Award at this year’s Chicago Underground Film Festival; and Steven Kostanski won Best Short for Bio-Cop. Last year, Kostanski won the Best of Fest (Feature) award for his own debut feature, Manborg. Also, two Director’s Choice awards were given to E.L. Katz’s Cheap Thrills (Feature) and Xander Robin’s Are We Not Cats? (Short).